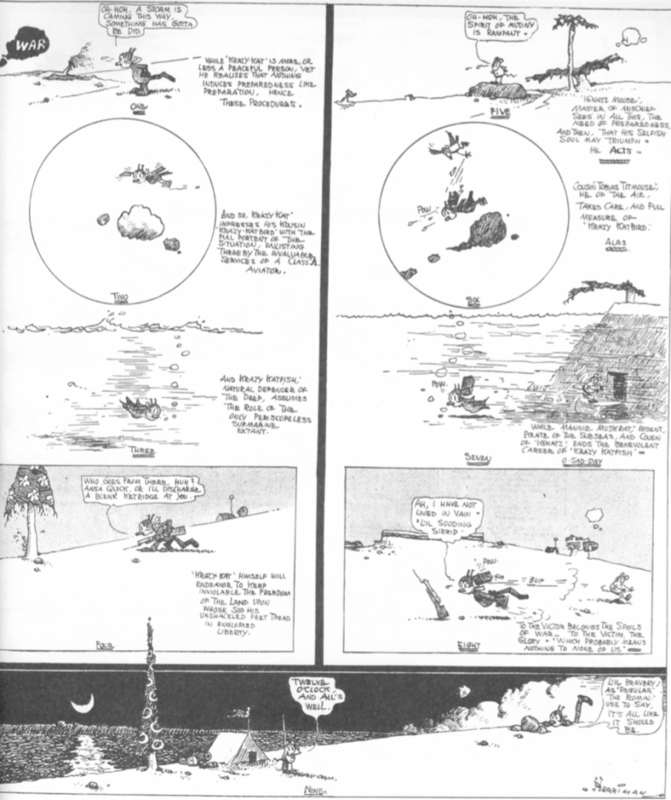 This is a post about the 3 Ages of Krazy Kat in Two Movements. Part I considers the underpinnings of criticism of the comic strip and its animated version, and the importance of race to that criticism. Part II will look more carefully at the animation itself, noting the different registers of blackface minstrelsy operating between the strip and the screen. Oscar Micheaux’s 1920 film, The Symbol of the Unconquered: The Story of the Ku Klux Klan was meant to be a rejoinder to D.W. Griffith’s noxious The Birth of a Nation (1915). In what remains of Symbol, Micheaux converts Griffith’s version of the Klan, as noble defenders of white virtue, into a scruffy band of thieves, con men, and vagabonds determined to steal land and wealth from honest black folk. Yet, the two films have something in common: a villain who is described as a “mulatto” (in Micheaux’s case, actually, an “odious mulatto”). For Griffith, the mixing of “white” and “black” blood produced the insane corruption of Silas Lynch and his co-conspirator Lydia—while Micheaux’s Driscoll was turned bad by internalized racism. Yet, either way, the figure of the tragic mulatto, so well established as a stereotype by the early 20th century, signaled derangement by racial formation. What does that have to do with Krazy Kat? A reasonable question. 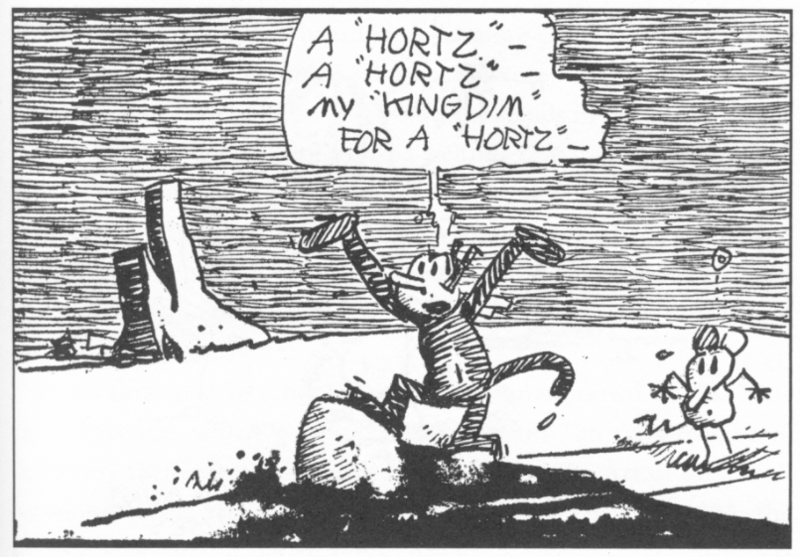 Krazy’s creator, George Herriman (1880-1944), is now well established, passed as white for his entire life. I want to examine three moments in the career of his most famous creation, because I want to look at Krazy Kat—a creature unmoored by/in gender, participating in the blackface masquerade that was early 20th century comics and animation, as embodying its tensions and contradictions, a polymorphously perverse derangement of the distinct racial formations she inhabited in her three ages. Due to the fact that by all accounts, Herriman quite enjoyed his life and experienced no outward signs of derangement from passing as white, I choose to see in Krazy’s endlessly morphing personae, and in Herriman’s self-representation alongside her, a pas de deux, a vaudevillian two-act of anxiety and desire—not only Herriman’s, but all of ours. Herriman was born black and died white. Yet, I am not so much interested in rooting out secret clues to Herriman’s identity in his comics and cartoons as I am in meditating on how the abusive and loving relationship between Krazy—whose gender and race were mutable—and the object of her affection, Ignatz Mouse, might serve as a metaphor for a life lived in passing, a psychic landscape of racial formation, and the celebration of semiotic uncertainty as a quiet rebellion. …newspaper bull-pens where Herriman learned his craft were open to immigrants but not to blacks…. 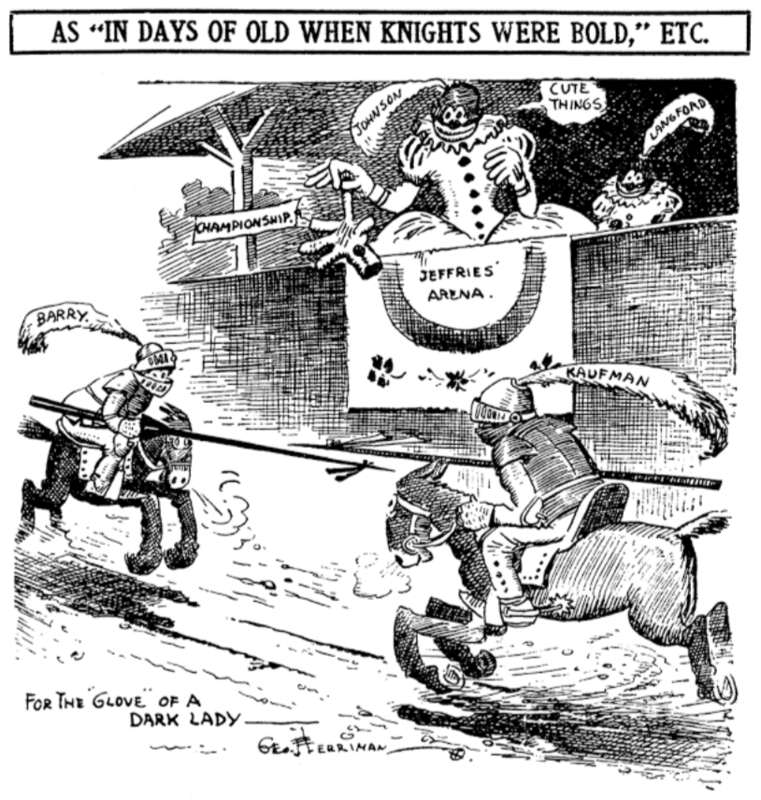 [and] Herriman’s early work reflected the larger trend in both cartooning and American racial politics…. During the heyday of Jim Crow, white cartoonists almost invariably portrayed African Americans as dim-witted, thick lipped, and childlike (Heer 2005)(e.g. see fig. 1). 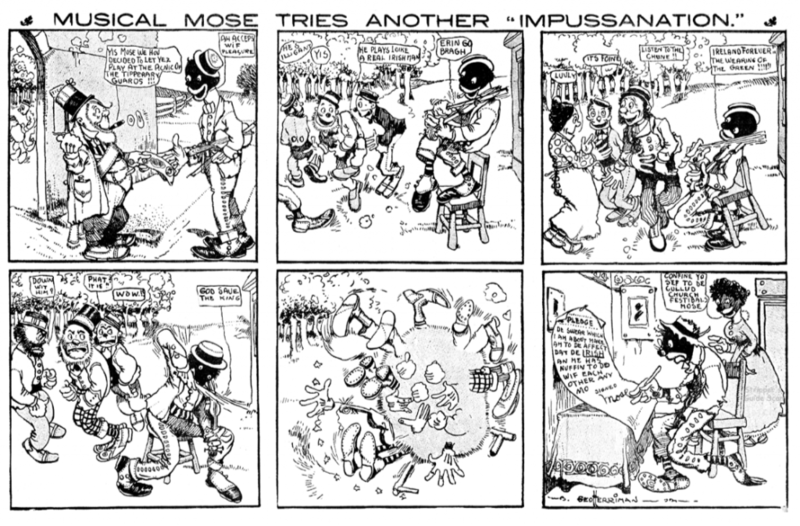 That was how Herriman depicted Johnson, and the Canadian boxer Sam Langford…as minstrels, and his first continuing character was Musical Mose, a black musician trying to pass as white (see fig. 2). The first age of Krazy Kat runs from 1913 to 1916, when the strip became a daily in William Randolph Hearst’s New York Evening Journal. What had begun in 1911 in other Herriman cartoons as an occasional sidebar gag featuring a mouse beaning a cat with a stone (fig. 3) became in short order a complex interspecies community residing in the arid, dusty landscape of Coconino County. 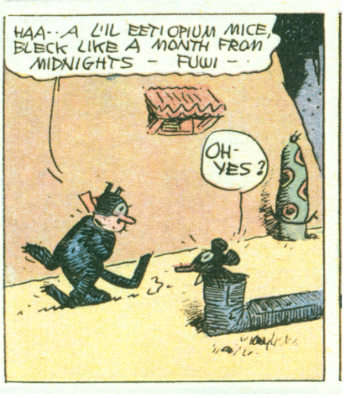 And, although the defining motif of Krazy Kat was that compulsive and repetitive act of violence, the general tenor of interaction between the denizens of Coconino County was warm camaraderie, often tinged with philosophical speculation on the nature of things, both human and otherwise. What sets the comic apart from most of its contemporaries is the sheer amount of conversation that fills almost every panel. And that colloquy is far from pedestrian: the strip abounds with references to Shakespeare, Plato, Darwin, and Cervantes (e.g. see fig. 4). Yet, more than simply referential, the words spoken in Coconino County are playful, polysemous, and allusive. At the center of this whirlwind of words is, of course, Krazy herself. While quite a few of the characters have accents, the cat speaks a peculiar argot that blends phrases that seem vaguely German or Yiddish with creole slang and idiosyncratic mispronunciations. 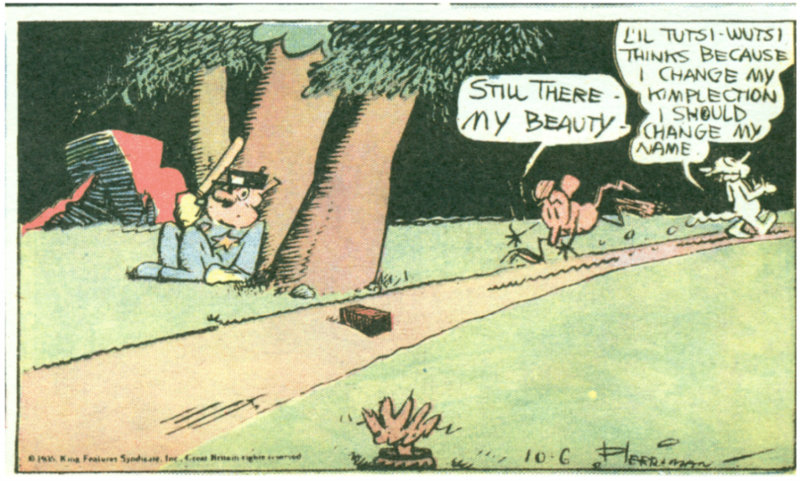 Regardless, though, of where his voice wanders, Krazy Kat speaks with an innocent enthusiasm for life and an awe and wonder that it has such creatures in it. ‘Kuriosity has led our heroine thus far—but seeing what he sees ‘kuriosity’ no longer impels her—he is now actuated with a sweltering confusion of benevolence.’ Here, Krazy’s gender switches no fewer than four times in one sentence (Tisserand 2016). Even the erotics of their relationship with Ignatz were not straightforward. We should not forget that the act that defined them as a couple was a brick to the back of the head, an act misinterpreted every single time: what Ignatz meant as violence, Krazy inevitably understood as love’s caress. In its compulsive repetition, that gesture could be read as sadomasochism. In that Ignatz aimed the brick at Krazy’s head, it might have been an attempt to convince her of his animus, to get it through their thick skull. Or, it could be the sorry, sad grinding of domestic violence, the mutual misapprehension of cruelty for loving attention. As if that weren’t enough Ignatz was married and had children; monogamy was also up for grabs. The strip returns every day for thirty years to a repetitive plot that is itself about repetition and obsession. Herriman emerges in the strip as one possessed by ideas of an historical and a racial self. He elaborates what amounts to a theory of the necessity of race for narrative, and of narrative for race. There is no narrative without color, for Herriman, because narrative is made of color, of figure-and-ground perceptions of color difference (Amirand 2000). Here, the slipperiness of gender is also read against instances in which cat and mouse change from black to white, or vice versa, to prove that the strip is obsessed with race in Jim Crow America. Ignatz is blackened with soot and Krazy instantly dislikes him (fig. 5). Krazy gets whitened at the beauty parlor and Ignatz falls for him, until it becomes clear who she is, at which point they say, “L’il tutsi wutsi thinks because I change my kimplection I should change my name.” Ignatz reacts by running for his brick, calling it “his beauty” (fig. 6). George Herriman had African-American ancestors and was aware of this fact. As an adult he adopted different strategies to deal with what his society taught him was an embarrassing ancestry. At times he hid his background and adopted the contempt his white friends had for black people. On the other hand, through his art Herriman tried to grapple with issues of identity and create a playful utopia, where different cultures could meet on equal ground (Heer 2005). While I agree with the description of Coconino County as a “playful utopia,” what Herriman faced as a man marked by the one-drop rule was a society in which lynchings were commonplace, and, for too much of the white population, a social event from which spectators could walk away with souvenirs ranging from photographs of the tortured, desecrated bodies of black people, to actual parts of those bodies. And the 1920s, Krazy Kat’s heyday, were when most of the Confederate statues over which we argue today were erected, designating public space as white space—Jim Crow set in stone. To say that in this context Herriman’s ancestry was “embarrassing” is an unfortunate understatement. …Krazy is not just a cat with black fur but also, in a profound way, an African-American cat. Krazy is revealed to have an uncle named Tom who lives in [a] cotton (or kotton) patch and sings the blues…. [and] his/her banjo is part of the minstrel tradition (Heer 2005)..
Amirand (2000) notes that the cat also had a relative named Kitty Kottentail, and that in one historical fantasy Krazy became Kleopatra, and another time referred to herself as a Hottentot (fig. 7). Amirand also tries to make the case that their cousin Katfish too is coded as black. Yes, Krazy was a black cat, and played the banjo, and sang the blues. Yet, the more substantial way in which Krazy Kat invokes stage minstrelsy is in its play with language. The endless and delightful mangling of the King’s English, the blending of other tongues with it, the banter and the wordplay speaks (quite literally) of the back and forth of Tambo and Bones as they mocked the Interlocutor through misdirection and feigned ignorance. And it invokes the stump speech, a solo performance in the middle of the olio that often offered coded political commentary, and always parodied the speech habits of the ruling class. Language was key to the careers of African American blackface minstrels such as Miller and Lyles or Amon Davis well into film’s sound era, and it was such feats of elocutionary contortion that were gradually replaced in the filmic versions of Krazy Kat with the slapstick and violent minstrelsy of animated blackface. Nicholas Sammond studies the cultural history and political economy of popular film and media. He is the author of Babes in Tomorrowland: Walt Disney and the Making of the American Child, 1930-1960 (Duke University Press, 2005) and Birth of an Industry: Blackface Minstrelsy and the Rise of American Animation (Duke University Press, 2015). He is also the editor of the volume Steel Chair to the Head: the Pleasure and Pain of Professional Wrestling (Duke University Press, 2005). Sammond has also created the Early Animation Wiki (www.rarebit.org), a research tool developed in collaboration with AnimationResources.org, and an animation research station in the Innis College Library.